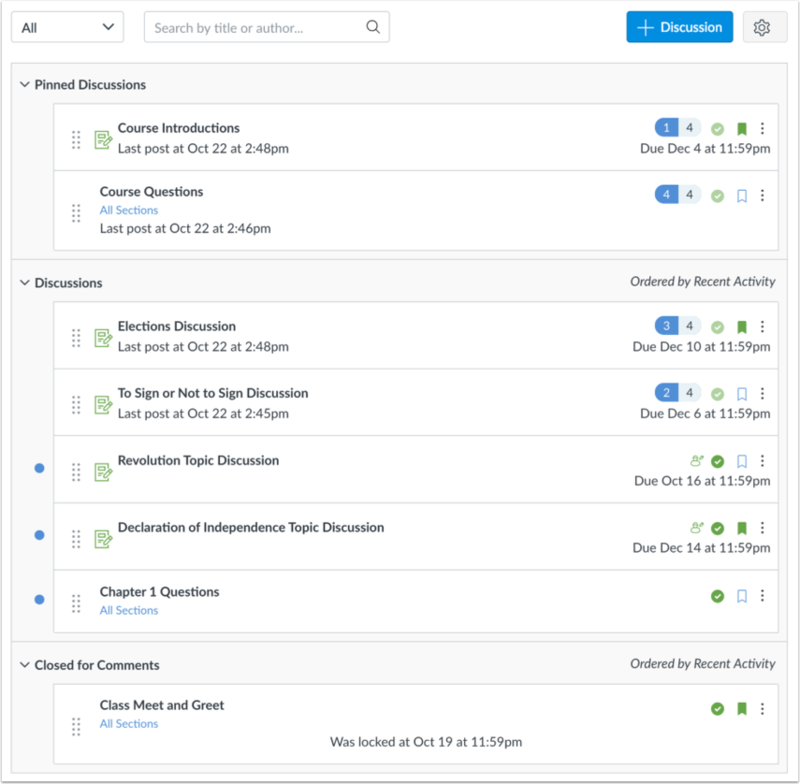 Canvas provides an integrated system for class discussions, allowing both instructors and students to start and contribute to as many discussion topics as desired. Discussions allows for interactive communication between two or more people; users can participate in a conversation with an entire class or group. 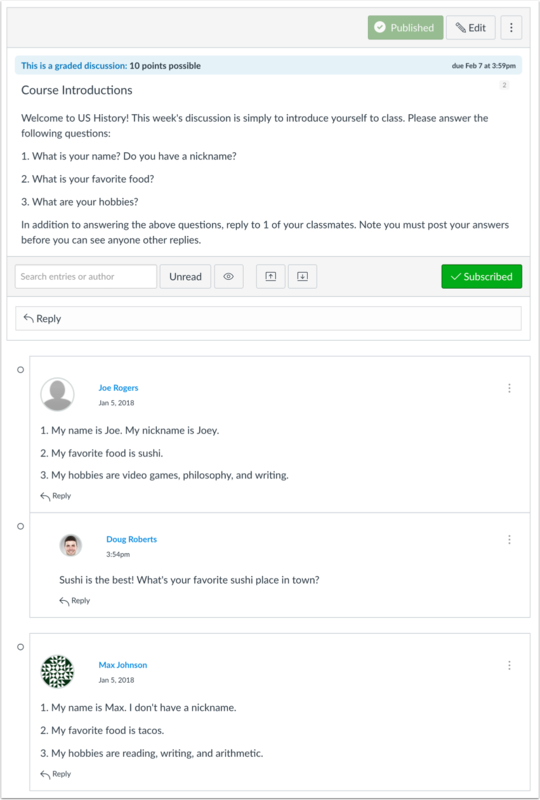 Discussions can also be created as an assignment for grading purposes (and seamlessly integrated with the Canvas Gradebook), or simply serve as a forum for topical and current events. Discussions can also be created within student groups. How do I use Discussions as an Instructor? Create, edit, and delete discussion topics. 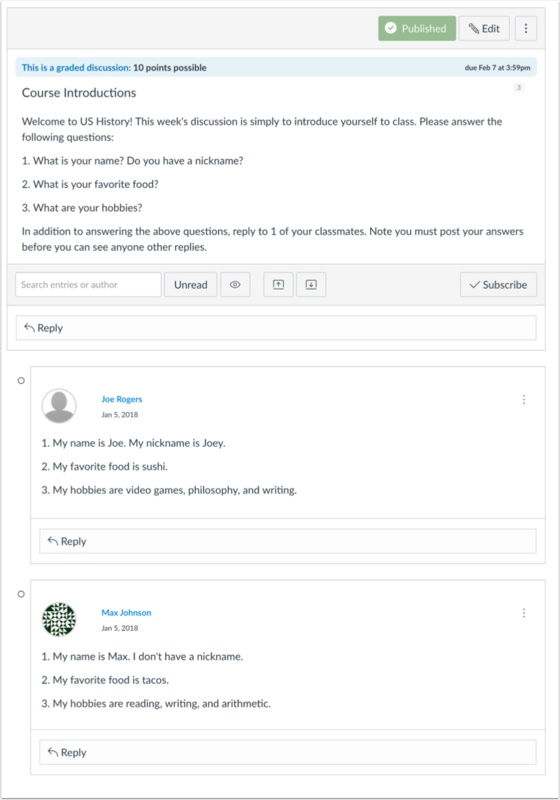 You can also reply to, edit, and delete individual student discussion posts. Create discussions with varied due dates for different sections within your course. Create a group discussion as an assignment. Create a graded discussion for everyone, individual students, course sections, or course groups. When a discussion is marked as a graded assignment, the Canvas SpeedGrader™ isolates each student’s comments from the thread and combines them into one easily readable view for grading. Subscribe to a discussion and be notified of replies. Enable podcast feeds within your discussions. Embed or attach files, images, and YouTube videos. Add course content directly from your course. Delay discussion posts until a defined date. Pin discussion threads that you want your students to see at the top of the Discussions page. Note: You can also use keyboard shortcuts to navigate individual discussion threads. Press the comma key and a pop-up window with keyboard shortcuts will appear for keyboard navigation. What Settings Can I Control in Discussions? Tell Canvas how to mark your discussion posts as read and unread. You can also manually mark posts as read. Require students to reply to a discussion before viewing other replies. Allow students to edit or delete their own discussion posts. Allow students to create new discussions and attach files in your course discussions (this setting does not apply to student groups). Allow students to like discussion replies in your course discussions. Close discussion threads to comments. How do I use Discussions as a Student? Create, edit, and delete discussion topics. You can also reply to individual student discussion posts. Subscribe to podcast feeds within discussions. Note: Your instructor may have some of these options disabled in your course. Previous Topic:What is the Course Import Tool? Table of Contents > Canvas Features > What are Discussions?